Skybus LLC/ Global GSE stocks a variety of lavatory service trucks. If you do not see what you need here, please contact us as we have new stock arriving weekly. Used Wollard TLS 770 Mounted on a Ford F350 Superduty Chassis. It has a high reach platform capable of reaching up to 137 inches. The lav truck is in good serviceable condition with fresh paint. 400-gallon capacity (1516 L) waste tank and 260-gallon (984 L) blue flush tank. 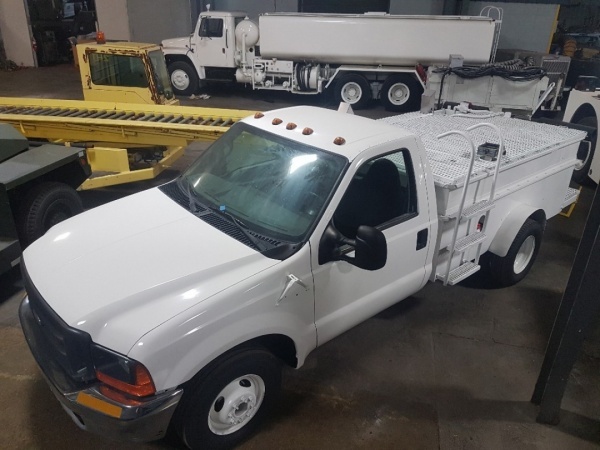 Used lavatory service truck is mounted on a 1999 Ford F350 chassis. It has an automatic transmission and a gasoline powered Ford Triton engine. It is equipped with a 250-gallon waste tank and a 200-gallon blue flush tank.